USTA League groups players by six National Tennis Rating Program (NTRP) levels, ranging from 2.5 (beginner) to 5.0 (advanced). 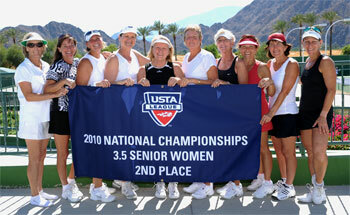 For more info on USTA Florida leagues, go to www.ustaflorida.com. The Orlando Junior Grand Prix, a series of tournaments created to expose young players to entry-level tournament play, will hold seven events between late October 2010 and March 2011. Entry fees are $25 per tournament, with deadlines at 6 p.m. on the Wednesdays prior to the event, and participants receive a t-shirt at their first event of the series played. Age groups are for boys and girls in the 8, 10, and 13 divisions. Remaining events are: Oct. 30 – Sanlando; Nov. 13 – WPTC; Dec. 4 – Orlando Country Club; Dec. 18 – Orlando Tennis Center; Jan. 15 – Winter Park High School; Feb. 5 – Lake Cane Tennis Center; and March 19 – Tuscawilla Country Club. For more information go to www.jrgrandprixtennis.com.